Last night I attended a performance by Angela Hewitt. 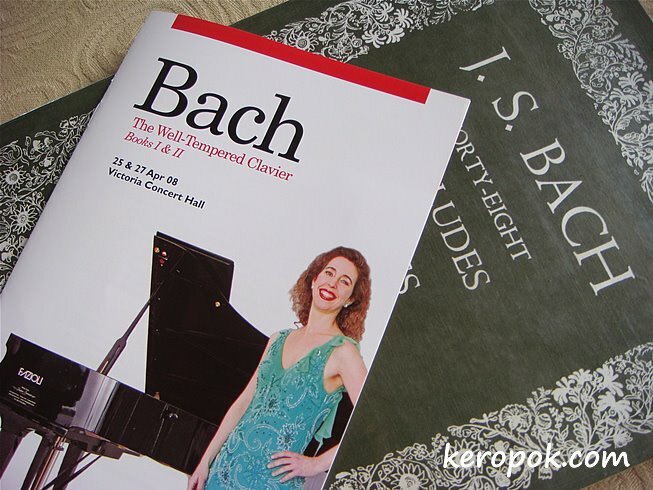 Angela is hailed as "the pre-eminent Bach pianist of our time" by The Guardian. No photography in the concert hall. So this is the program booklet and my J.S. Bach Prelude & Fugue scores I had to play for my ABRSM more than 15 years ago. The concert is in two parts. Book I yesterday and Book II tomorrow night (Apr 27). If you are in Singapore, you can still buy the tickets if they are not sold out. Yes, I am one of those kids who grew up with classical music. That was the only music on the radio until I was old enough to buy my own radio. We all studied music. My brother even made it his profession! Yes I studied piano, but gave up on it too soon...Too impatient for practicing! Keropok..your book brought back lotsa childhood memories.. I was also one of those kids who struggled with classical music.. I played the piano from aged 10-18. I had to practice at least an hour a day at the beginning and it progressed to 2 hours per day. After I left home for college, I refused to pay it ever since.